I was recently hired by a client who had entered into a contract for purchase of an existing home. I was to perform the whole house inspection for them. As usual, I arrived slightly earlier than my pre-approved scheduled appointment and noticed that the current owner was still home. It's not common and actually a bit awkward for the homeowner to be present during inspections. So I patiently waited to see if they were in a hustle to leave so as not to rush them even more. After five minutes of no visible activity, I decided to politely introduce myself and knock on the door. A surprised young man greeted me by saying hello and asking if he could help me. After explaining who I was and why I was there, he looked confused and stated he wasn’t expecting me until 2 hours later as that was what he was told by his agent. This is unfortunately par for the course with many real estate agents in the area. How they can fail to properly communicate and coordinate with their clients, yet still remain active and thriving sales people is beyond my comprehension… but I digress. I politely assured the homeowner that I was only slightly early and showed him my confirmation email for the scheduled date and time. He apologized and began gathering his things. We chit-chatted a bit and he began telling me all the improvements that had been done to the home. I get mixed emotions when able to discuss these types of things with the current owners. They are obviously proud of their achievements, but it is my job to find any concerns with the home… which often relate to those very home improvements the owner is discussing. Part of this home improvement included a home weatherization upgrade offered by a local gas utility company. As with many such programs, they offer home weatherization improvements at little to no cost for qualifying owners. The improvements, such as upgrading insulation or installing a new natural gas furnace, are made by a team of energy efficiency professionals from Community Action Partnership between the “professionals” and the utility company. These programs are funded ultimately by our tax dollars at work through government subsidies. As with most of these programs, the same team of professionals who perform the upgrades, also performs the energy audit. The result of such an energy overhaul is a home that's supposed to be more comfortable, safe and energy efficient, and which “should” lead to lower energy consumption and lower energy bills. After discussing all these improvements and showing me a few of the unique attributes of the home, the owner vacated the premises and left me to my work. All in all, the home was a pleasant inspection with typical nick-knack minor concerns encountered. It was quite obvious that the current and previous owners had invested a lot of time and money in this 1940’s rambler for modern improvements and upgrades. Their care showed, and it would make a nice modest home for the future owners. Attics and crawl spaces I typically save for last since I usually get very dirty inspecting them. As I was about to enter the first of three separate attics, I recalled the current owner explaining how he treated the energy professionals to lunches and plenty of free drinks during their work. 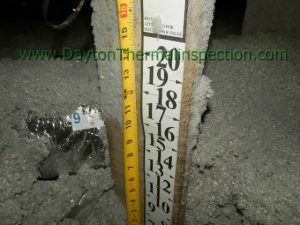 As reward, the owner stated that the energy professionals installed a full sixteen inches of loose fill insulation… four more inches than they were required to install. Now I've heard some tall tales in my lifetime, and if this was one of them, the detailed story would certainly be at the top of my all-time favorites. But I had no reason to doubt this owner's sincerity and openness. As I reached the top of the access stairs, sure enough I was greeted by freshly blown loose fill cellulose insulation! 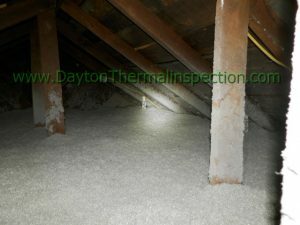 As part of the installation process to uniformly blow in loose fill insulation, the installers will first place strips of cardboard at strategic locations throughout the attic. These strips are printed with one inch increments marking their face. 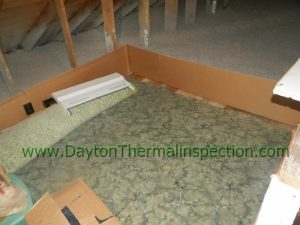 They are stapled fast to an upright framing member and used as a depth gauge so the installer knows they have enough insulation blown throughout once the level reaches a predetermined height. These depth gauges also provide homeowners an easy visual indication of the amount of insulation that was installed, as the numbers and markings are large and easily read from a distance. 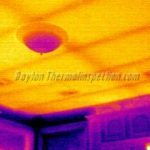 I was keenly interested in this particular attic since I had earlier detected a large infrared thermal exception in the ceiling below. 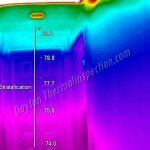 It was a single large mass of heat conducting through the ceiling which was consistent with missing or marginal insulation. At the top of the stairs, I quickly discovered why the thermal anomaly was detected… a large section of flooring had been laid down for storage. The weatherization contractors built a cardboard dam around the perimeter of this 12’x12’ area and insulated the rest of the attic. While not uncommon, it still was a large source of heat loss/gain and reduced energy efficiency that likely could have been better addressed by the weatherization professionals. 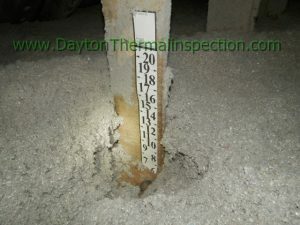 I continued to look around the attic noticing several depth gauges and very uniform insulation blown throughout level just at the sixteen inch mark or slightly below. But something caught my eye to take a second look. The cardboard dam was not overly tall. Perhaps slightly taller than the length of a sheet of paper, placing it at about twelve inches in height. Hmmmm…. If the insulation were at sixteen inches of depth, this particular dam would be overflowing wouldn’t it? But then I thought perhaps the installed flooring ended at the dam. If this were the case, then we would need to adjust for another few inches of ceiling framing… maybe four… perhaps six additional inches... and that might explain the perceived inconsistencies. So I decided to investigate in order to clear my now growing suspicious thoughts. With gloved hand, I carefully excavated some insulation on just the other side of the cardboard dam. Floor boards! I excavated another spot further out… more floor boards! “Wait!” I thought to myself. If the depth gauge says the insulation is at sixteen inches, then it’s sixteen inches! Right? Not so fast…I'm not the best at math, but things just weren't adding up for this admittedly slow calculator. I couldn't just let this go anymore, and so my suspicions grew with my need to find an answer. 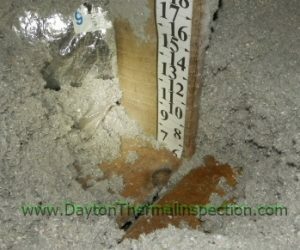 I spied a strip of depth gauge within reach of the storage platform that wouldn’t require me to wade through a now questionable sixteen inches of loose fill cellulose, and began another excavation. I now felt like an archeologist on an expedition dig for delicate and rare Jurassic period fossils as I carefully scooped the overburden away. Reaching the floor boards once again, I finally spotted the problem! A defective depth gauge! It had to be defective! Right? I mean, surely no weatherization “professional” would deceive the homeowner and the utility company by claiming they installed sixteen inches of insulation when in fact they hadn’t! 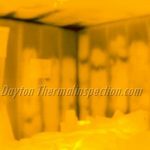 After all, they performed the energy audit that stated more insulation was needed… and after they installed it, this very same company performed their own quality assurance control measures! And then they were paid for a full sixteen inches of materials plus the labor… as well treated to lunches and free drinks by the benevolent homeowner! Alas, my hopes in their trustworthiness were dashed. For at the bottom of this strip of cardboard were the tell-tale signs… The first six inches were missing. Nowhere to be found. The weatherization “professionals” had torn the gauge off at six inches, stapled it to the framing flush with the floor boards, and then proceeded to fill to the sixteen inch mark. Comparing to my highly sophisticated, reusable measuring device, their sixteen inches and my sixteen inches didn’t jive. They weren’t even close. The homeowner had been duped. But it’s not just the homeowner, it’s the utility company and ultimately us as taxpayers who paid for this deceit and fraud. Unfortunately this also is par for the course in the weatherization industry which, like some absent-minded real estate agents, continues to thrive. It’s hands in pockets for easy paychecks and easy fraud. Most all of these government subsidized “professional” programs are left to their own checks and balances system. They get paid on quantity not quality. They can make any homeowner believe they need thousands in repairs when they don't. And they can make any homeowner believe that the job was fully completed with a passing grade when it wasn't. But when third parties have a chance to perform follow-up inspections, time and again we find fraud and deceit. It’s not difficult to find report after report, story after story of similar events and circumstances in the weatherization industry across the country via a simple internet search. It happens A LOT in both new construction and existing home weatherization upgrades. 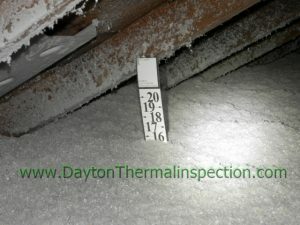 While it can be argued that the ten inches (rather than sixteen) of insulation the homeowner did receive was an improvement over what had (or hadn’t) been there previously, it still infuriates me that this fraudulent company was paid for work and materials that were never delivered. Sixteen inches should equal sixteen inches, unless it’s not sixteen inches but only ten. My advice… free isn’t really free. Someone has to pay for it. If you are considering weatherization upgrades, also consider hiring separate third party providers to oversee your project and hold the “professionals” to their word. 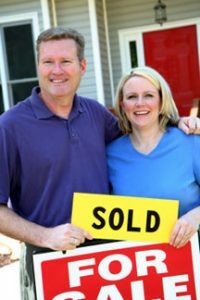 It might just save some future headaches, frustration, and embarrassment when it comes time to sell your home!